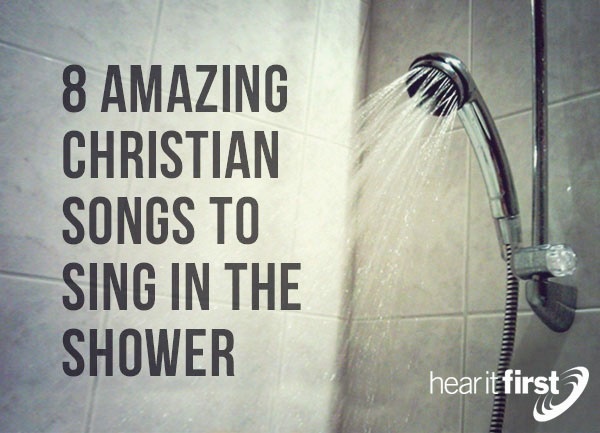 Here are eight songs that I think you'll really enjoy singing in the shower or anywhere for that matter. This is a very potent song about falling and getting back up again. We fall but we will rise again and this rubble that’s found won’t keep us down. We take all the pieces of the puzzle and put them back together again and keep on fighting the good fight of faith. Who among us haven’t had our dreams shattered and our life made a mess? There is always hope and looking up is the only way we can look when we’re down but then, we’re already in the position to kneel before God and ask His help. It is actually ash that makes concrete so strong! This band has gotten worship music right and this song is about a situation in which we all, sooner or later (or now!) will find ourselves in. Like Job cried out, “Though he slay me, I will hope in him” (Job 13:15) and that’s a lot hard to do than it sounds, believe me. You probably already know that! To give thanks for all things (1st Thess 5:18) is exceedingly difficult but God is please when we trust in Him, in the storms of life. He is the “God Who gives and takes away” and praising Him regardless opens up the blessings of God. This song is contagious and you won’t get it out of your head if you sing this in the shower, the car or on the rooftop. It praises our Great God for His precious grace that’s rained down upon unworthy sinners. This flood of love came crashing down, not as the judgment of the flood in Noah’s day, but in a cascade of the precious blood of the Holy Lamb of God that washed all our sins away. All I can say is “Hallelujah, grace like rain, pouring down on me” and “all my (your) stains are washed away.” Praise God! This song has a bit of a rocky edge to it but the words are absolutely wonderful. They make me want to fall on my face and praise Him. The singer asks for God to take him “past the outer courts, Into the Holy Place, past the brazen altar, Lord I want to see Your face” and brings to mind Psalm 84:2 where the psalmist prays, “My soul longs, yes, faints for the courts of the Lord” and to be in the presence of the Most Holy God. That day is coming (Rev 21:3) where “will see his face” (Rev 22:4). How awesome that day will be! Wow…this works better than a cup of coffee for me because it’s all about Jesus and that’s what it should be all about. Serving Him, glorifying Him, and living a life pleasing to Him as Chris Tomlin clearly sings that He’s the reason for which we live and it’s all about Him. I counted about 35 mentions of Jesus which should even energize you even more. This is a fill up of the premium brand of joy and worship of Jesus and turns into a high octane joy that’s contagious. God blesses those who praise and glorify Jesus’ name so it’s all good my friend when you sing this song in the shower or anywhere. We have this song occasionally in our worships services and it makes us look forward to that day when we see Jesus Christ in all of His splendid glory. Imagine: the very Light of Life right in front of us. Right now, I’m with MercyMe; I can only imagine what that day will be like but it is coming (Rev 21:3; 22:4). As for whether I will dance or fall down, I’m on my face before Him; not sure what you’ll do. I do know that at the very least, every knee will deservedly bow to Him! This is a modern rendition of a very traditional classic that precisely summarizes the gospel and that answers the critical question, “What can wash my sins away….nothing but the blood of Jesus.” In this large scale production, I am reminded of the huge numbers of singers, instruments, and participants in the worship services, particularly during the feast days. These were no small gatherings as there were harps, cymbals, horns, trumpets, harps, lyres, and in ancient Israel, “They were all under the direction of their father in the music in the house of the Lord with cymbals, harps, and lyres for the service of the house of God. Asaph, Jeduthun, and Heman were under the order of the king” (1st Chron 25:6) so think about that when you see the video of this but the words are timeless and have eternal consequences (John 3:16). I was also going to suggest “We Fall Down” by Kutless but it didn’t seem appropriate because most accidents happen in the bathroom. Life is fragile. There is no guarantee that tomorrow may ever come and the enemies of God would love nothing more than for you to procrastinate on turning to Christ and placing your faith in Him, if you haven’t already done so. Satan is a liar and so is man, but God alone can be trusted. We can trust in a God that’s omnipotent (all-powerful), omniscient (all-knowing), and omnipresent (present everywhere, at all times). This means that God was with us and drawing us to Himself (John 6:44) in the past, that He is with us now as you are reading this (Matt 28:20) as He promised Abraham (Gen 28:15), and will be with us throughout eternity and can actually see His face and (Rev 21:3) He will be with us Rev 21:4) for time without end.